A lot of scientists in town are here to study Wildlife. Among them, some French ornithologists from the CEBC (Centre d’Etudes Biologiques de Chizé – La Rochelle). 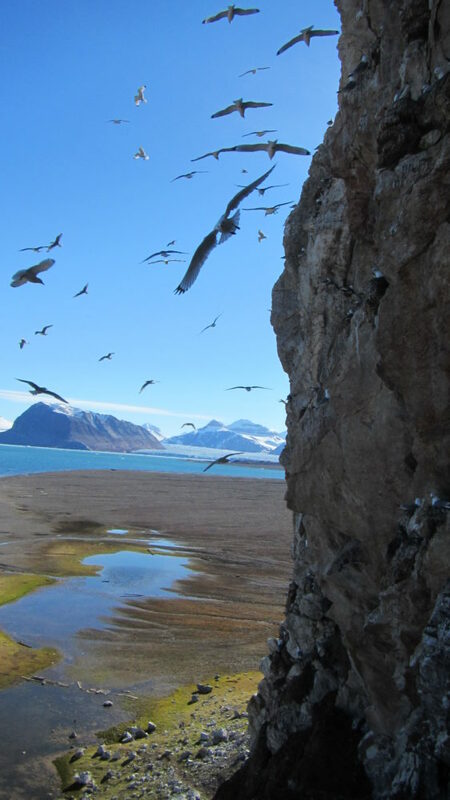 They are highly interested by Kittiwakes living some kilometers away from Ny-Alesund. I spent one day in the field with them and discovered their work. 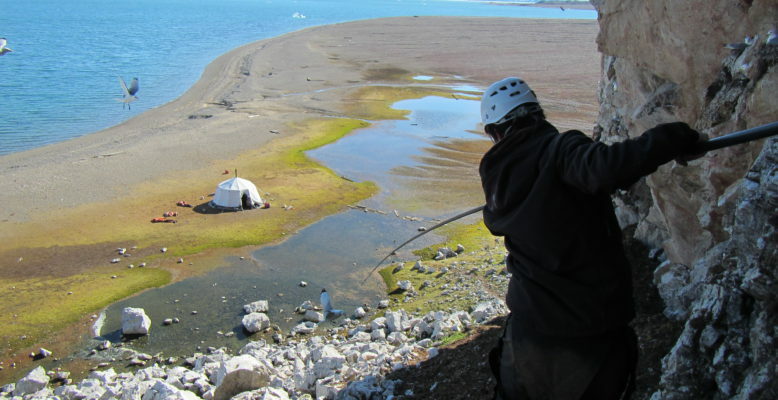 The aim of this day was to deploy and collect GPS (Global Positioning System) and GLS (Global Locating System). 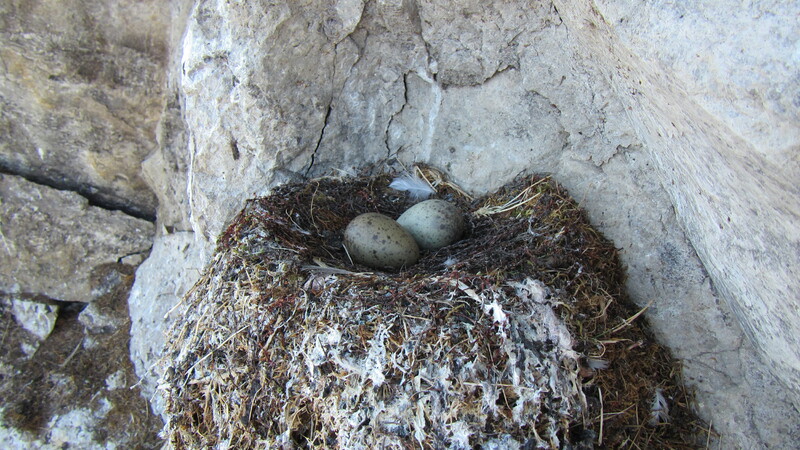 To do so, ornithologists catch birds with a sort of fishing rod when they are nesting. They put the little rope around the neck of the bird and this one will fly because of the disturbance. The little rope gets tighten when the bird is moving, this way, ornithologists can gently put the bird down and catch it. The manipulation of the bird is done as quickly as possible to prevent the animal to be too much stressed. 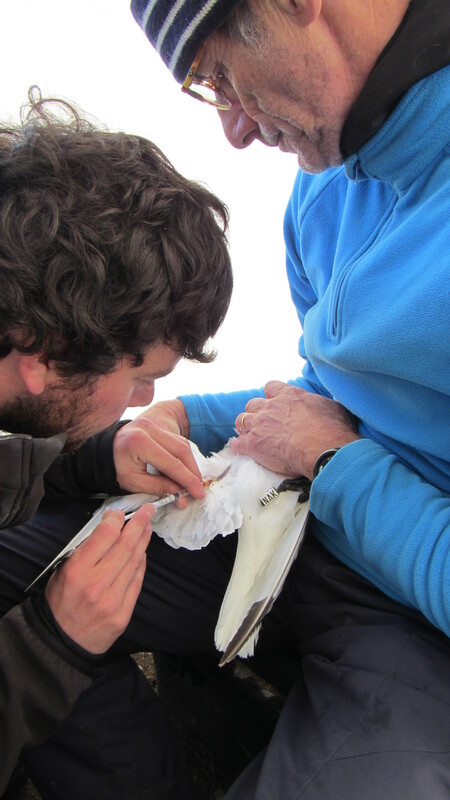 Scientists then take blood samples from the wing’s veins and also some feathers so they can analyze it later. 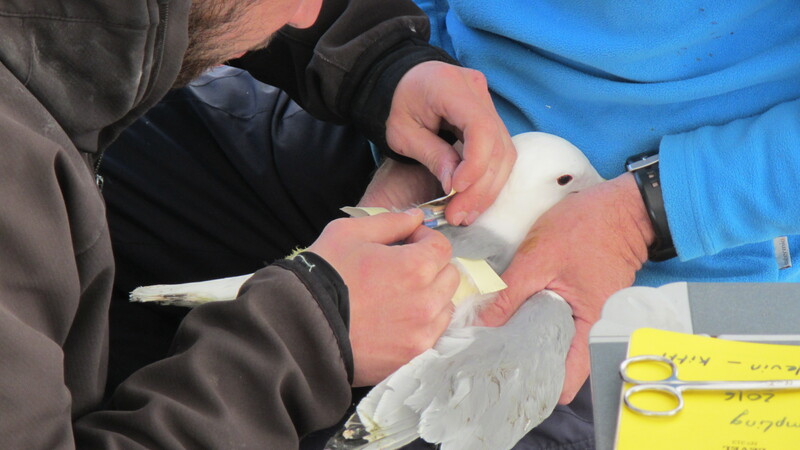 The kittiwake is also measured (culmen, beak’s height, tarsus, wing length) and weighed. 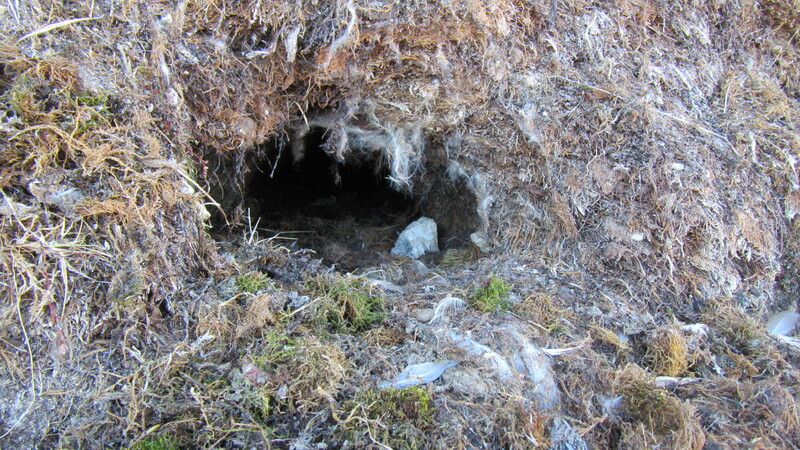 They also keep trace of the location of the nest because Kittiwakes tend to come back to the same nest year after year. They can see the history of the bird by looking for its band. 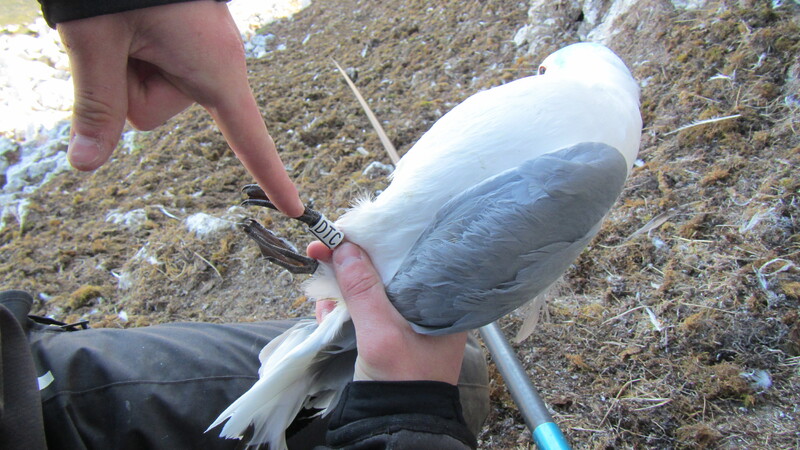 Each band has a particular number and they can look on the records if this bird was already caught before and what happened to it. 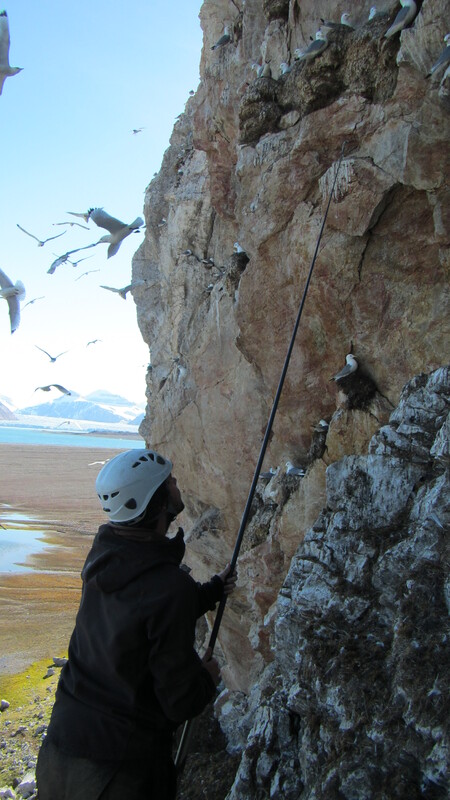 The GPS collect data concerning the bird’s travel. This is very useful to see how often the kittiwake goes to the ocean to get food. The GPS need to be retrieved after 3-4 days due to the battery life time. 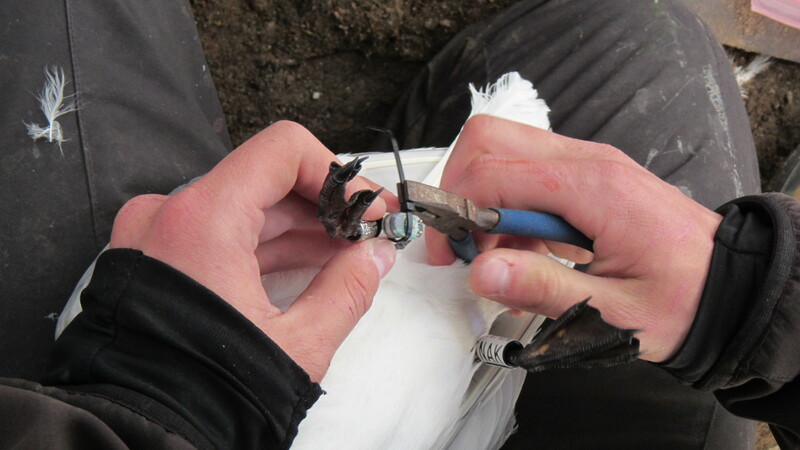 The chance to get the GPS back is also decreasing with time, the system is attached in a way that the bird can get rid of it after some time in case it can’t be catch back. The GLS system gives information about the light. 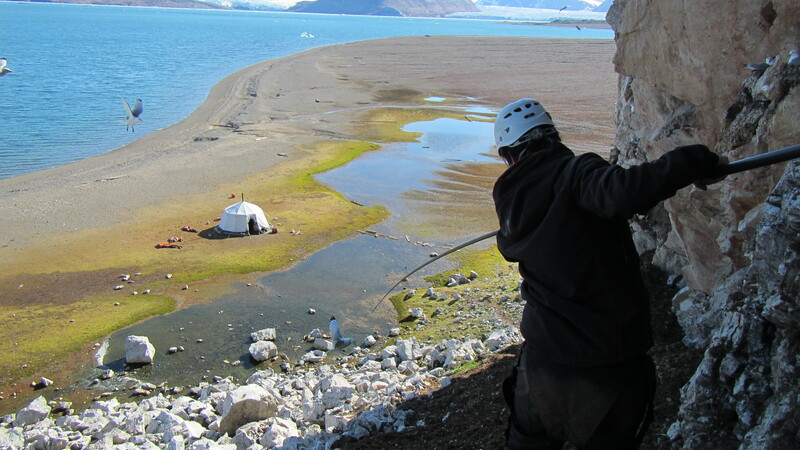 In Ny-Alesund we have now midnight sun so it will measure that there is always light. 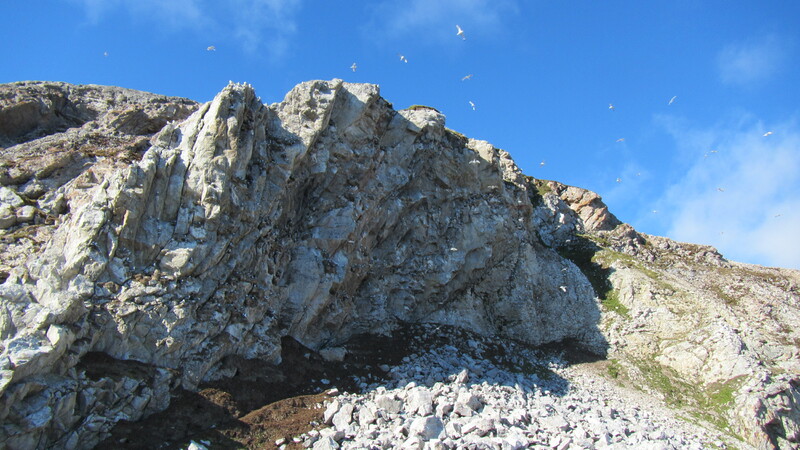 If the bird travels far from here and comes back, the system will allows scientists to see that at some point, the kittiwake went to an area with darkness. They can then determine the latitudes where the birds went. 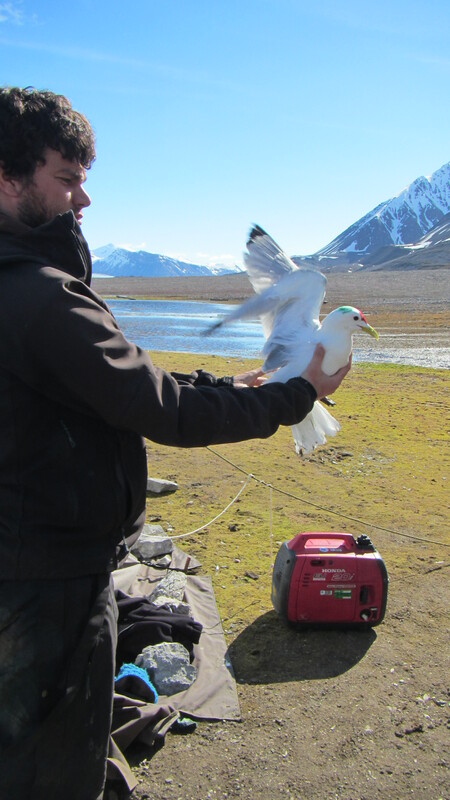 After manipulation, the kittiwake is released and can go back to its nest. The colony is really crowded at the moment so this is not rare that the nest is “stolen” by another bird in the meantime. When the manipulated bird is coming back to his nest, he has to kick out the invader.